Raymond W. Walker, 72, of Vandergrift passed away December 30, 2018. He was born October 30, 1946 and the son of the late Wilson (Dorothy Adams) Walker. Raymond worked for Babcock and Wilcox’s in Apollo and as a custodian. 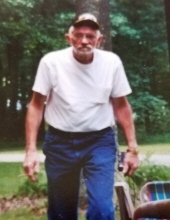 Raymond enjoyed the outdoors, where he would hunt, fish, and garden. He is survived by his wife of 32 years Janet Rupert Walker of Parks Township, a brother Richard (Donna) Walker of Florida, and several nieces and nephews. In addition to his parents he is preceded in death by a son Raymond Walker II. A private Celebration of Life will take place at a later date. Arrangements are entrusted to The Janette L. Gamble Funeral Home Inc. 2842 River Road Vandergrift, PA 15690, (724) 567-7006. Online condolences may be made at Gamblefh.com. To send flowers or a remembrance gift to the family of Raymond W. Walker, please visit our Tribute Store. "Email Address" would like to share the life celebration of Raymond W. Walker. Click on the "link" to go to share a favorite memory or leave a condolence message for the family.